You'll be £12.99 closer to your next £10.00 credit when you purchase Arnhem - Battle of the Woods. What's this? Jumping in to Drop Zones eight to ten miles from Arnhem on the second day of Operation Market Garden was always going to be difficult for Brigadier “Shan” Hackett's 4th British Parachute Brigade. With little information on how 1 Para Brigade's battle went the day before or what faced them on the ground the stage was set for an epic battle. Author John Waddy, veteran company commander in 156 Para Battalion and a team of some of the best Arnhem experts take the viewer to the ground where 4 Para Brigade tangled with the SS troopers of the Hohenstaufen Panzer Division in the woods to the west of Arnhem in what was to be an unequal but heroic battle; the result of a flawed concept and plan. Driven back from the German blocking position the Brigade was withdrawing across Landing Zone P when the Polish heavy lift aboard gliders swept in to further chaos to a rapidly deteriorating situation. Captain Quirepel was awarded a posthumous Victoria Cross for his action in helping stem the enemy advance long enough for the Paratroopers to escape across the railway embankment by nightfall. On the third day of the battle veterans recall a lethal day of cat and mouse in the woods as the Paratroopers and surviving glider soldiers struggled to rejoin the rest of the Division around Oosterbeek. I’ve reviewed quite a few Battlefield History DVD’s before, and they just kept getting better and better. This DVD does an admirable job of helping the viewer get a feel for what the battlefield was like. The clips of re-enactors, equipment and visits to military museums add to the atmosphere and depth of the production. I enjoyed watching it immensely, and recommend it wholeheartedly. A part of the superb Operation Market Garden series, which is surely the definitive DVD study of the ill-fated campaign. This episode follows the progress of the 4th Parachute Brigade during the first three days of their part in the battle, from the heavily opposed landing on Ginkel Heath and the failed attempt to reach their objectives by breaking through the strong and well-prepared German defences, to the desperate fighting which took place in the woods to the west of Oosterbeek as the shattered remnants of the Brigade attempted to reach the comparative safety of the Divisional Perimeter. As with all Battlefield History TV programmes, a group of highly knowledgeable historians walk the battlefields, and with the assistance of several veterans, discuss each phase of the Brigade’s movements. This DVD tells the story with the aid of archive footage and survivors of the battle. Major John Waddy, of 156 Para battalion is just one of the experts who will guide you through the battle and tell the story of how the Polish heavy lift descended into a hopeless situation, and how Captain Queripel won his VC. 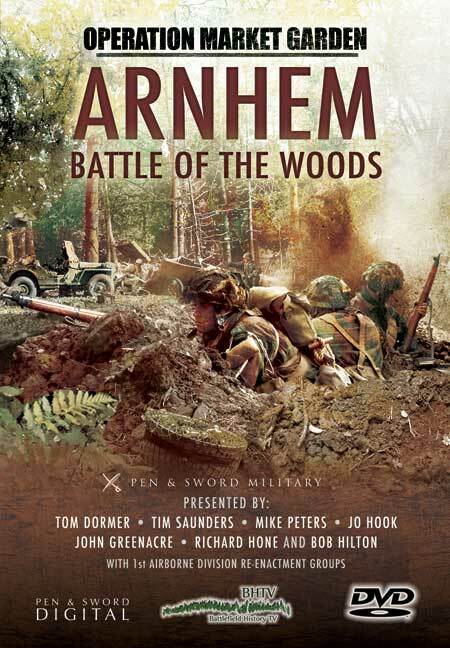 Arnhem - Battle of the Woods is the second instalment of the three part Market Garden DVD collection from BHTV (Battlefield History TV). BHTV has developed into a slick, highly professional production company. They have gathered together a group of experts that are so well versed in their subject that they leave nothing to the imagination, the facts are painted right in front of your eyes. Using re-enactors from the 1st Airborne re-enactment Group this DVD gives such a complete overview of the events surrounding the battle fought between 4th Para Brigade and the SS troopers of the Hosenstauffen Panzer Division in the woods West of Arnhem. If the purpose of this DVD was solely to encourage viewers to take a Battlefield tour to Arnhem then for me it is a resounding success. Visiting the museums shown in the DVD has been added to my "must do" list. Also being able to see the re-enactment group using the equipment used in Operation Market Garden in the actual battlefield location makes you want to go there yourself. As always, the inclusion of testament from veterans of the September 1944 campaign adds a personnel touch to the hard facts presented by the BHTV team. I found myself becoming more and more immersed in this DVD as I watched. Arnhem has always been a story of a badly conceived plan executed by extremely brave men from British, American and Polish Divisions, but it is of course a much larger story full of battles that many of us know very little about. This series of DVD's helps to put that right and I feel that I have learnt so much about an important if unsuccessful piece of our WW2 military history. An excellent 80 minutes of entertainment for all those interested in second world war history and especially Arnhem.